Ribfest is coming back to Niagara Falls and what better time than a warm weekend in June? If you’re staying with us at the Skyline Inn Hotel on Father’s Day weekend be sure to check it out! The 10th Annual Niagara Falls Ribfest, hosted by the Niagara Falls Rotary Club, will be featuring mouth-watering ribs and all day entertainment. The Niagara Falls Ribfest will also be featuring live bands playing all weekend starting at 6p.m. on Friday night until 7:30p.m. on Sunday. For the full entertainment schedule, visit http://www.niagarafallsribfest.com/Entertainment.html and see what Niagara Falls Ribfest has to offer. During the weekend you’ll also be able to vote for the winner of the 2014 Award for Winning Ribs. The power is in your (messy) hands! Ribfest has chosen only the best rib vendors to participate in the contest, so you get to sample the very best! 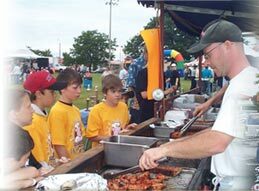 Since the festival lands on Father’s Day, Ribfest offers fun activities for the whole family. Enjoy free WIFI access, daily 50/50 draws, Kids’ Midway and a raffle for a state of the art Napoleon BBQ! Treat your father to great food and great entertainment, then kick back and relax in one of the luxurious rooms at the Skyline Inn. The perfect Father’s Day weekend awaits you in Niagara Falls this summer so don’t miss out!